Have you ever bought a house? If so, during the search process you probably heard this mantra: location, location, location. Real estate agents have shared this piece advice with homebuyers for decades because where a house is located affects desirability and resale value more than any other factors. No matter how much you remodel, no one wants to live next to noisy railroad tracks or on top of an old landfill. Nothing else makes a difference if your home is in a terrible location. Similarly, the main reason why on-site search matters so much is for a purpose so important that merits repeating too: SEO, SEO, SEO (also known as search engine optimization). So, tell me what you want, what you really, really want? These days, 38% of customers start searches at Amazon, and 35% begin at Google. On top of that, mobile users almost exclusively use search over navigation. Considering numbers like these, it’s no wonder why nearly all digital marketers place a high priority on the role SEO plays in helping a website attract traffic, but many forget to think about how their website’s on-site search functionality impacts SEO. Fantastic! You got people to your website. Now, for the hard part: How do you keep them there? How do you prevent them from bouncing away to a competitor’s website? And, how do you help them find what they need? According to Hubspot, 76% of website visitors say the most important factor on any website is how it is to find what they want. You can’t put everything on every page, so what do you do? Some people who come to your website will not know how to find what they need. Some may be in a hurry or not want to use your navigation. One solution? Add friction-free on-site search functionality. On websites that provide it, 30% of website visitors will perform an on-site search. Providing on-site search is key to increasing conversions with this portion of your target audience. If you’re looking to differentiate yourself from the competition online, an excellent on-site search experience is a crucial. Without it, you may find yourself struggling to optimize user experience (and, as we all know, that can hurt your brand reputation). As a bonus, you can use analytics on what words and phrases users type into your on-site search to track keywords and better to understand what they want as well as how your target audiences refer to what they’re hunting for so that you can make adjustments to improve your content and better help them find what they want. Most people who use on-site search are in the consideration stage or decision stage of the buyer’s journey, making them twice as likely to make a purchase (or are more likely to return and buy). People who use on-site search also spend a significantly longer time on sites (and view more pages). If your website has only a dozen or so pages, it probably doesn’t need an on-site search feature. But, if you have a lot of content and you’ve determined you need to integrate an internal search, make sure it’s useful and customized around your target audience’s needs by following these best practices. You might think search placement is a no-brainer, but there are little things you can do to make your search field more prominent on your website so users can find it quickly. Pull up your website. By default is your on-site search hidden? Many website designers—especially when creating the mobile of a site—like to hide search functionality behind a magnifying glass icon to free up room for other design elements, but this tactic makes it more likely for users to overlook search compared to when the search is displayed as a full open-text field and submit button. Regarding optimal search bar design, your field should accommodate 27 characters, which is the length of about 90% of queries. And, don’t forget to keep its design simple! When it comes to search, less is more. If you must include them, save boolean operations for those super users who want those advanced options. Zappos puts its on-site search bar front and center on all versions of its website. The only thing worse than no search results are lousy, inaccurate search results. Try some of these strategies to help people get to what they need as fast as possible. One way to help your visitors doing on-site searches is by creating a list of quick links that help direct visitors to the most popular searched for content. It also doesn’t hurt to provide a few hints above your search bar to let users know what they can find and help them get started with their on-site search. On Alibis’s current website, their developers have integrated searching hints within the actual search field, but accessibility studies have shown that users find search bars easier to use when hints are included atop and outside of search bars. Here’s a quick mock-up of what it might look like if Alibis improved its search bar’s usability by moving its helper text, making it always be visible for users. 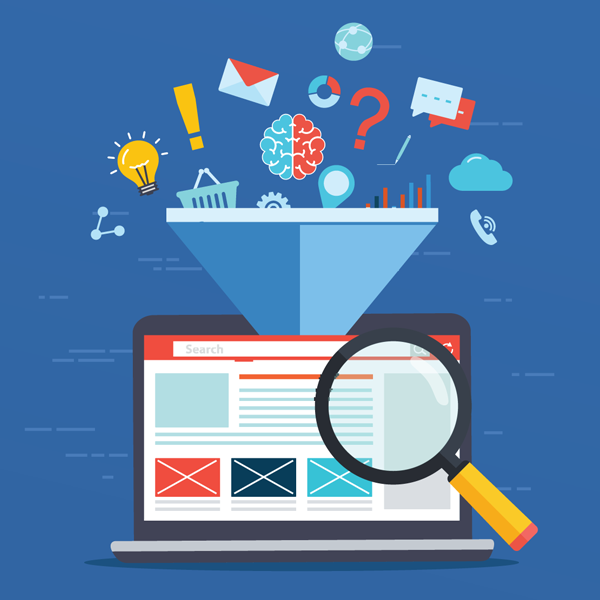 If you have the time and budget to do even more refining to improve your on-site search and create a better user experience, look into integrating some predictive functionality because they can provide your customers with even more valuable results. 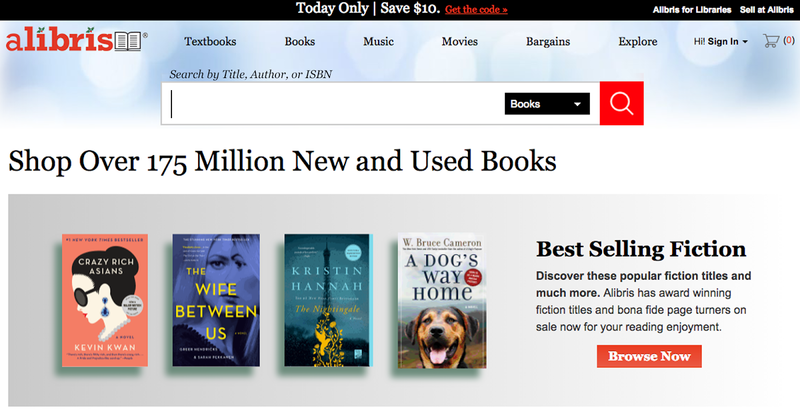 Target (left) provides quick links by default before users start their searches and Paste Magazine (right) uses autosuggest to make it easy for users to quickly find what they want. In 1960, Elvis had a worldwide hit with his version of the Neapolitan ballad, “It’s Now or Never (’O Sole Mio).” Do you think the developers at Spotify had this song on their mind when, in 2011, they introduced predictive search to make it quicker (and easier) for their users find the music they want (exactly when they want it)? Talk about now or never! Since the addition of this on-site search functionality, Spotify’s system makes guesses to help you discover the song, album, or artist you’re looking for immediately and presents an assortment of smart recommendations as you type. The more you enter into the search bar, the more accurate the results. 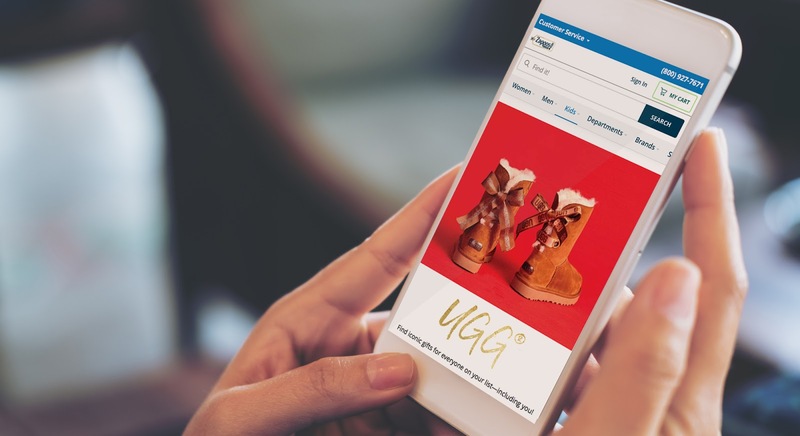 While your would-be customers probably don’t have a lot in common with obnoxious “bad eggs” like Veruca, they do very likely that have her same impatience when using your on-site search. In a world where quick-loading, comprehensive, and helpful Pinterest-style visual search result pages are more of an expectation than an exception, one significant way your company can differentiate itself from the competition is by building a search solution that provides photo-based suggestions at a glance. The proverb a photo is worth 1,000 words has stuck around for a reason, and—especially when it comes to search results—providing images can make your recommendations even more useful to your customers. 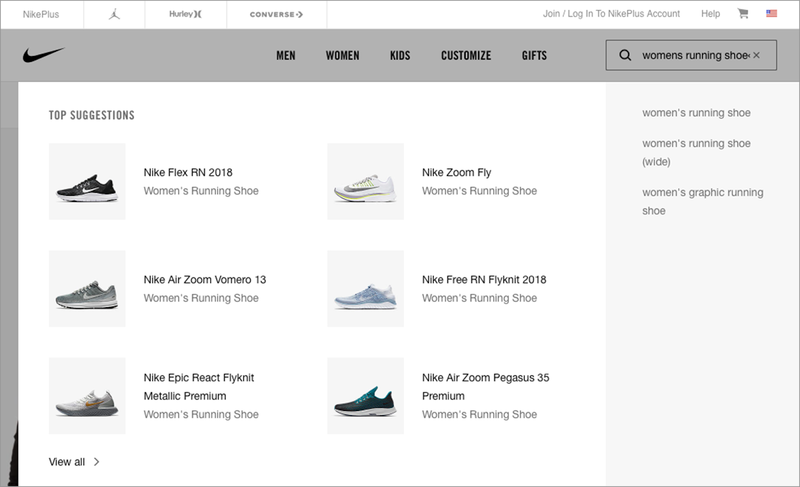 Nike uses a variety product photos matching a user’s search input as part of their visual search results display. 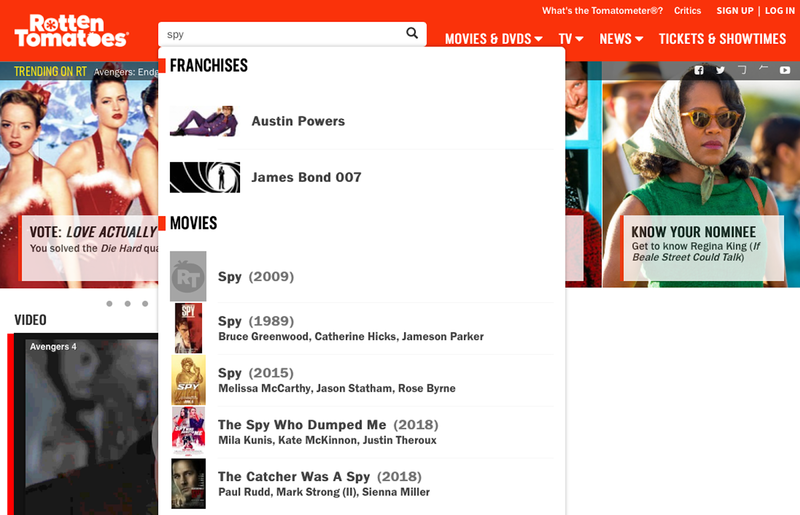 Rotten Tomatoes includes images as part of its initial search result recommendations to help its users find what they want on their website. When I first heard digital marketing pros use the frankenword “searchandize,” I thought it might something to do with Sears and their famous catalog, but the term is actually a the combination of the words “searching” and “merchandising,” and it’s all about providing great customer service. To searchandize your on-site search, tweak displayed results to direct your users to the best matching products, services, or informations. Sure, you might be looking for headphones, but Amazon searchandizes its results to let you know what other related items you might also want to buy. Have you ever gone to Amazon’s website to purchase one thing and ended up buying that item and something else related to it? That’s searchandizing at work. Searchandizing is one the technique Amazon’s digital marketing team uses to guide you—as their customer—to related promoted deals and other associated products or services based on your initial on-site search. That way, Amazon is not just giving you what you want, but it is also providing you with the option to buy items you didn’t even realize you might have needed, too. Talk about optimizing your website to make it your best salesperson! We’ve talked a lot about what to do when presenting on-site search results, but what happens when a user’s query turns up nothing? Just as you should customize your 404 page to make it as helpful as possible so users don’t leave your website, you should also make sure that you create a customized page to display when a search turns up nothing. Using the internal search tool on your website shouldn’t stress out your customers. It doesn’t make a difference if your site visitors are looking for a replacement widget or a new doctor. When you help your website users find the information they’re looking for quickly (and make the on-site search process more manageable and helpful), you’re well on your way to doing a better job keeping those users on your site—and converting!